This flavor-forward dish is a makeover of one of my husband’s childhood favorites. I replaced the can of cream of mushroom soup and mayonnaise with a creamy homemade sauce instead, and – my whole family agrees – the outcome does not disappoint! This one does require a little advance planning though – just be sure to cook your rice and chicken in advance so it doesn’t take very long to pull it together at dinner time. 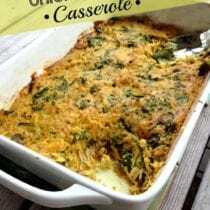 Combine the cooked rice, broccoli, and chicken in the casserole dish and set aside. Melt the butter in a medium sauté pan over medium heat. Add the onions and cook, stirring, until softened, about 2 minutes. Add the garlic and flour and cook for 1 or 2 minutes, or until the flour begins to brown but doesn’t burn, whisking almost continuously. Whisk in the milk, watching for lumps, reduce heat and cook until it thickens. Stir in the sour cream, grated cheese, curry powder, salt, and pepper and stir until well combined. Bring to a simmer and cook, stirring, until the mixture is the consistency of gravy, about 3 to 4 minutes. Pour the sauce in the baking dish and mix thoroughly with the rice, broccoli, and chicken and spread it out evenly in the baking dish. Bake for 10 to 12 minutes, and then turn it up to a high broil to brown the top for another couple minutes. Serve warm. This looks so good. I have made a lot of chicken and rice dishes but they always seem to call for canned soups. I also like that this one has curry. This sounds really good. My husband does not care for cooked broccoli. Do you think asparagus, green beans or peas would work? Is that 1 cup of rice measured before cooking, or 1 cup,after cooking? Yum! This looks really tasty. I think this recipe would work with tricolor quinoa too. I’ve been obsessed with quinoa lately! It used to be brown rice now I find myself posting so many quinoa recipes. It’s amazing how I go through so many phases! Why do people think putting curry powder in something makes it a curry? LOL That’s like saying putting chili powder in something makes it chili. Are you suggesting a different name for this dish? It tasted pretty much like curry to me! Then obviously you have unfortunately never tasted a true curry dish …. Dan, I totally agree with you! Is this the real food version of “Chicken Divan”? I was just hoping for something like this the other day! Is the 1 c. of rice measured before or after cooking? Thanks! I’m in love with this chicken curry casserole! Seems to me the perfect comfort food! Can I substitute the wheat flour with another non gluten flour ? Do you recommend a good match? Hi Jen. I use Bob’s Red Mill Whole Grain GF blend for most recipes. I’ve not tried it in this one but think it will work just fine. This recipe sounds delicious, but I’m trying avoid dairy. What do you recommend as substitutes for milk and sour cream? Thanks! Hi Susan. I use almond or coconut milk and plain coconut yogurt. I can’t wait to try this! Think it’d be ok to use left over chicken and rice!??? and I’m pretty sure that the Bob’s Redmill flour mentioned above would work fine. I use it for pretty much everything! While this does look quite good, it is not real “curry”. I am a bit off-put by the use of curry powder… why not use the REAL spices achieved to make curry – turmeric, chili powder, garam masala, coriander, etc. I don’t think it’s fair to give the recipe a low rating when you haven’t actually tried it. I am simply rating this recipe based on the ingredients and preparation steps presented…..That is fair. Comments and criticism is fair game. I agree with Kayla, it is not fair to rate a recipe unless you have tried it. It was delish! As stated in my initial comment, I said the recipe looks good, my issue is with the spices…..
My rating does not change – two stars based on the ingredients!!!! Isn’t curry powder just a blend of these spices? How is this any different than using the separate spices? Curry powder is a Westernized version of the mix of spices used which relies heavily on turmeric (which also gives the yellow colour)…..The amount of curry powder used in the recipe in no way makes it taste even relatively close to an actual curry…..
What substitutions would you use in place of the curry powder? Some of us do not know that this isn’t a “curry” dish and are unsure what amounts of the other spices to use. I would suggest 1 tsp turmeric, 1/2 tsp chili powder, 1/4 tsp garam masala, and 1/2 tsp coriander powder. Then adjust per your personal taste. To all the people freaking out over the dish not being “real curry”: a casserole’s name usually says what is in it. There’s nothing wrong with calling it a curry casserole because that’s exactly what’s in the casserole…it’s the only spice. I don’t think that the author is even trying to make people think that it is traditional curry, so there is no reason to get upset or give the recipe a bad rating. There’s curry powder in the casserole, hence calling it a curry casserole. Well, for starters, I ACTUALLY made this dish…and we LOVED it. I don’t give a crap what you call it, it’s delicious. Thanks for another great recipe Lisa! I made this tonight (though I cut the curry to one teaspoon to appease my picky husband) and it was delicious. Will definitely be making it again. Chicken curry is love! It’s one of my favorite food. I will give this a try and get back to you for my feedback! Anyway, can I replace cheddar cheese? I would love to use Parmesan or mozzarella. This Chicken Curry Casserole is definitely a keeper. I will be making it again. It is delicious! Loved it. My husband said it was better than his mother’s recipe. We loved the extra curry. This looks so good! I wonder what protein would be best to sub to make it vegetarian..? Maybe chickepeas would work in place of the chicken? Good idea, Maggie or sauteed organic tofu. We love thai food and this did not disappoint! This was delicious! I don’t understand why there are so many people freaking over this being called curry casserole…It has curry in it! Sounds like a legit reason to call it curry casserole to me. :) All 3 of my boys actually ate it…which is so unusual for them to all like the same thing! I did add more like 3 cups of chicken and had to add about another 1/2 cup of milk at the end because my sauce was way too thick, but this will be going into my rotation! Thanks so much! Is it 1 cup of (dry) rice, then cook it, or is it 1 cup of cooked rice? Looks good! What size casserole seems to work best? Hi. A 9 x 13 works well. Does this freeze well? I’m expecting baby number 2 in a couple of weeks and looking for more real food freezer meals…would this be a good option? This is the first time I’ve actually commented on a recipe but I feel compelled to do so because I actually made this recipe and can vouch for it. This was a delicious, hearty meal and my entire family enjoyed it. It was a little dairy heavy for me to classify it as healthy but we’ll for sure be making it again. Great flavor, not to spicy so even my Grandma and 19 month old would eat it. I’m actually going to make it again tomorrow to bring to a friend who just had new baby! Thanks for sharing! Hello! I have made this omitting the chicken. Came out just fine. If you are a vegetarian that eats eggs – The second time serving, I added dippy eggs (placed on top of the plated casserole. It was quite nummy. I love the flavours of this curry casserole, but I have one small problem: when I make this, I need to double the sauce ingredients (and that’s a LOT of cheese!) so that it is saucy. Is anyone else having this issue? Mine doesn’t even resemble the picture if I don’t double the sauce. What I’ve been thinking of doing: lay down rice, broccoli and chicken mix, pour over the milk, onion and curry, 1/2 the cheese, etc mix, do not mix, then sprinkle the remaining cheese over the top so it melts and browns nicely over the top. But then there’s nothing holding the rice, broccoli and chicken together… Such a dilemma! So bizarre! I doubled the recipe, to feed our family of 7, and made it exactly as written and it looked just like the picture. So weird that you are having issues! Wish I could help. This was amazing, we substituted in ground turkey for the chicken, and peas for the broccoli and we thought it was delish! Only other addition, we added hot sauce to each bowl individually later to give it a bit more kick based on personal preference. Overall, YUM! Super easy to make and was great as leftovers. My husband, daughter, and I loved this! I used greek yogurt rather than sour cream. I prefer the mixture to be tiny bit more soupy, and so I added another 1/2 cup of milk. Was perfect and delicious! Thank you, Thank you for such yummy dishes! We tried this tonight and it was a hit! My husband went back for seconds (that’s always a good sign!) I did have to add more milk before mixing the sauce into the chicken, broccoli and rice. It was thicker than gravy and it needed to be thinned out a bit. But it was very tasty! I often times make the whole chicken in a crockpot , shred the chicken and freeze it. Do you think I could use the frozen , previously cooked chicken in this recipe? Would I just defrost the chicken the night before in the fridge then add it to the dish? Hi Christy. Yep, this recipe calls for cooked chicken. And yes, defrost it first. This has just been added to my meal plan for next week. Looks D-lish! I just made this last night and it was a hit. My son really liked it, but I believe my husband loved it as he had thirds!! LOL Personally, I felt it was a little salty, however I could have been a little heavy on the cheese. Oops! Always looking for good wholesome recipes! Thanks! This was delicious! I cooked my basmati rice in coconut milk, and used coconut milk for the sauce as well. Gave it a very full flavor. Thanks for a great, and fun, recipe to put together. From start to finish, took me 47 minutes including my cleanup! Can this be frozen? Meaning, make 2- 1 for now and 1 for later? I’m planning to make this tonight but all I have is red curry paste and ‘regular’ curry powder. Can I substitute for the yellow? Hi Christianna. Sorry that we are rarely able to answer recipe questions in real time. How did it turn out? I am currently doing on own mini 21 days of real food and have enjoyed every recipe on this site so far. My question is can I substitute the sour cream for plain yogurt? The only reason I am asking it would save one less thing on my grocery list because I have lots of yogurt on hand. Has anyone tired this ? Hi Tonya. We don’t share nutrition information as we try to avoid getting caught up in numbers. This post helps explain: https://www.100daysofrealfood.com/2013/01/04/healthy-eating-defined/. I’ve made this twice in the past few weeks and love it! It’s pretty quick if you cook the rice and chicken ahead of time and I really enjoy the yellow curry flavor in something other than Thai food, which I’m also a big fan of, but fun to see the versatility of the spice. Thanks for another awesome recipe! Has anyone tried freezing this! If so, did you bake it before freezing or just assemble? Hi DC, I would freeze it before baking. So broccoli cheese rice with chicken and curry…I’ll give it a whirl! We love this dish!! It’s in the oven right now actually and smells delicious!!! This looks delicious! I love rice but I am hearing a lot about the arsenic. What are your thoughts? Hi Melissa. This might help: http://www.realnatural.org/the-surprising-way-to-avoid-arsenic-in-rice/. Love this recipe! I love curry spice but was a tad skeptical at first due to the cheese so I cut the recipe completely in half. Cutting it in half worked just fine and it was delicious! I also didn’t have any broccoli left so I used sauteed spinach which I will do again next time. This recipe is amazing!! I have been looking for a chicken/broccoli/rice casserole for years. They all seem to have canned soup. I made the recipe exactly as it was written. I wouldn’t change a thing. It was the best chicken casserole I have ever eaten!! The only negative is that It did mess up quite a few pans. Next time I will cook the rice and chicken ahead of time to make it easier on myself . In the end, It was SO worth it!! Thank you! I did not have any sour cream on hand, so I omitted it and added the juice of one lemon. I also added a little more milk to get the right consistency. I turned out delicious! So good!! I added Portabella mushrooms and they gave the casserole an extra layer of flavor. I’ll be adding this into the monthly dinner rotation! My husband and I love this dish!! It is wonderful and the 4 teaspoons of curry powder give it such incredible flavor. I add an extra 1/2 cup of milk to make it a bit creamier and I try to buy a rotisserie chicken, shred, and freeze it to make it easier to assemble on a weeknight. My husband doesn’t like broccoli. Do you think I could substitute for cauliflower? Yep, I think cauliflower will do well. I have leftover shredded pork… Would this work in place of the shredded chicken? That’s not something we’ve tired. I made this tonight for my family and the neighborhood kids and all I can say is WOW! I had five kids here for dinner and four of the five hate broccoli. Well lets just say the whole thing is gone. I only got a tiny scoop after serving them seconds but I will be making this again this weekend. I even had two kids ask me to email their parents this recipe! For the 1 cup dry brown rice, should I use instant or regular? Thanks for this – I’ve been waiting a long time to make my mother’s very unhealthy Chicken Divan, and this is close enough to pass for it! We do not use regular milk at all, and I wanted to let you know that I used unsweetened coconut milk and did not lose any of the taste or consistency, making it even healthier! I love coconut milk with any type of curry! Yum!! 20 mins to make, 10 to bake. Very good with or without curry. I love this version. This is one of my kids favorites, and I love making it from scratch. But you definitely need to add the lemon juice–just a few tablespoons. Without it the flavor is lacking, but with it, it is better tasting than the original canned soup recipe. Yummy! Made this several times and will double and save some to freeze. umm I am going to try tonight with cauliflower and coconut milk.. Yummy gluten free too ! I will use corn starch instead of flour! Have made this recipe 3 times. First time I found it dry and that was with 1 1/2 c. milk. Next time I added 1 large can of diced tomatoes and used garam masala instead of curry. Love it now. This recipe was a huge hit with my family. Don’t change a thing. It’s perfect the way it is. 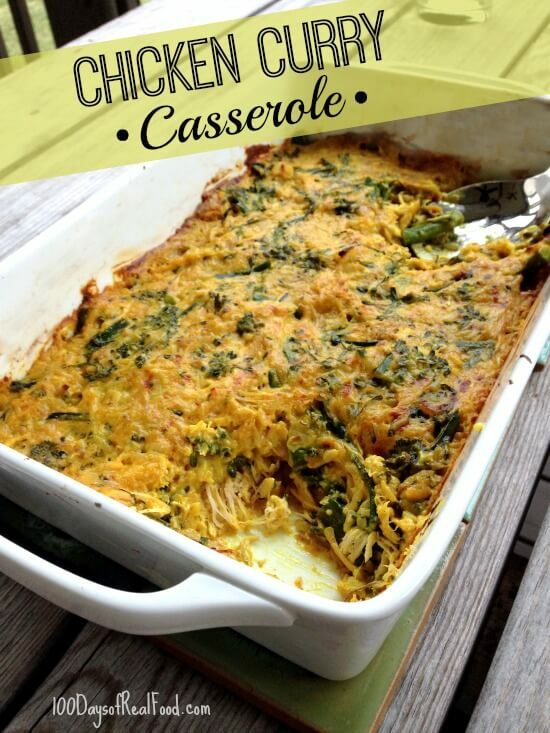 I’ve made this casserole several times and love it! I’ve used half garam masala and half curry powder, Parmesan, cheddar cheese, whole milk yogurt instead of the sour cream… it’s delicious with or without those substitutions! Wow, this was a big win for our family! My husband and I loved it; however, my kids didn’t like the casserole as they are not used to eating food mixed together. I didn’t expect them to like it but I will keep this as a regular dish as I couldn’t stop eating it!! One mistake I made was putting in UNCOOKED rice! When I realized, I just added chicken stock (about 1.5 cups) and covered it tightly. It took about 1 hr and 15 min at 350 for the rice to be cooked. But it was even more delicious this way! I highly recommend it – and shared it with my friends and family! Can this be made the day before baking? liked it. I was worried about the garlic, onion, flour mix. It got really thick fast but it all worked out. I added more milk to make it more like a gravy but it remained thick. Nevertheless, i was pleased with it. Next time, I will most likely use white rice. For some reason brown rice always gives me problem s when I cook it. Can you male this ahead and freeze this? This was delicious! My hubby balked the first of the week when I told him that I was making a curry dish. So I didn’t make it until tonight and did not tell him. He ate 2 bowls!! !